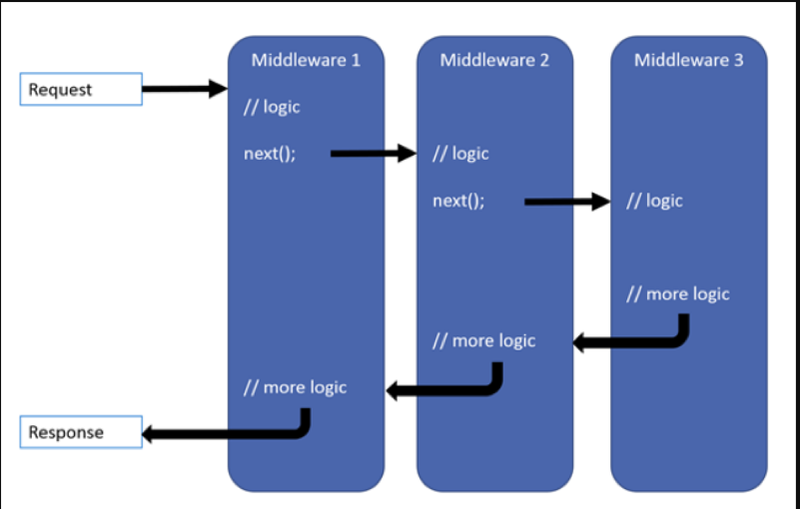 The term middleware is used in a .NET Core application either to delegate a request to the next component in the pipeline or short circuit it. It delegates the request to the next component in the pipeline. Business logic can be written before and after the component is invoked in the pipeline. There are three extension methods Run, Map, and Use which can be configured as request delegates. Each request delegated can be written as a single line as an anonymous method (aka in-line middleware) or separately as a middleware component. These components are responsible for invoking the next delegate in the pipeline or to short circuit it. Each delegate can also decide not to pass a request to the next delegate, which is known as short circuiting. An advantage of short circuiting is, it doesn’t pass the request to the following delegate if it doesn’t meet specific criteria. For example, if a request doesn’t have a specific parameter in its URL, then it can short circuit the pipeline and returns the response directly from there. On the other hand, branching helps to map the request based on matches and executes the specific branch (can be a method). Map and MapWhen extensions are provided by .NET Core by default for branching the pipeline. Let’s practically see all this. 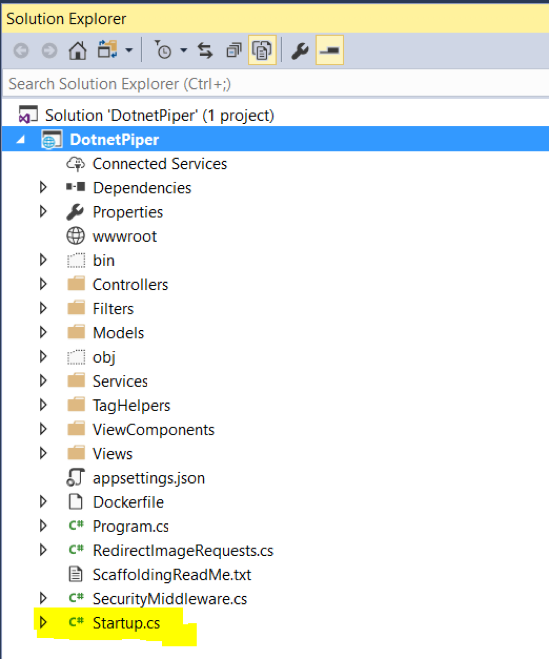 Open a startup.cs file and search for configure method; it comes out-of-box with .NET Core applications. This method gets called by the runtime. Use this method to configure the HTTP request pipeline. To meet purpose I’ve written code using Use extension method and set a limitation so that if a specific request contains a query string in its URL, then it should not go further in pipeline otherwise it should go till the Run method. Press F5 and run an application. As shown in the screen above it skips the remaining pipeline and responds from the use extension method only. Though Run method always executes if you don’t short circuit. Note: If you use the above code segment, await next.Invoke(); which is being used to call next component or further delegate in the pipeline. In this case it is the app.Run() method. E.g., kindly copy and paste the following code snippet in your configure method and run an application. Let’s run an application and see how it works. Press F5 and application will open in the browser to ensure that the application is up and running. As the name implies, branching means a resembling of the branches of a tree. It’s somewhere same in .NET Core also. As defined in the screenshot above, map method branches the request pipeline based on the matches of the given request path. If the request path starts with the given path, the branch will execute. Code snippet: Keep the code segment in Configure() method of startup file. Press F5 to run your application. Note: Kindly replace localhost port with your application’s one. As soon as you execute the URL, it verifies and matches the request and reaches to the branching delegate. In our case, its HandleMapMiddlewareOne and respond directly from there. The same way it should work for MapWhen with the bit different condition in the below code snippet. Hope this helps you to understand Short Circuiting and Branching in .NET Core.